Sorry I missed posting on Thursday, but I’m fighting off a cold and I really haven’t done much new in terms of quilting, so this will be a short post. 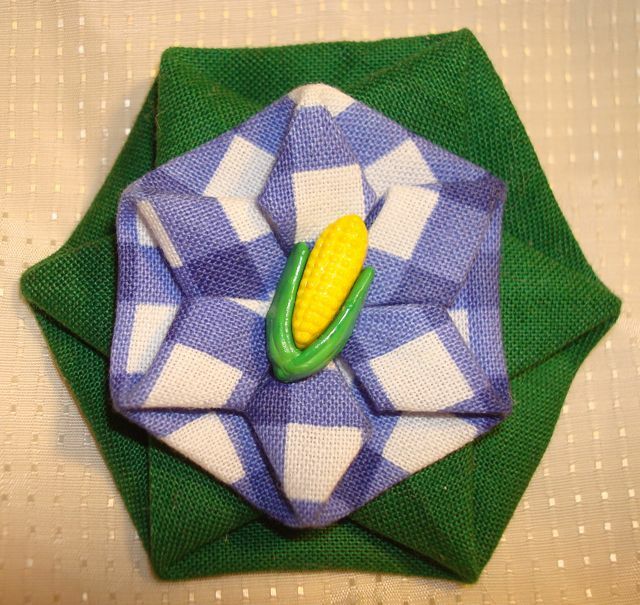 I have done some sewing, though. 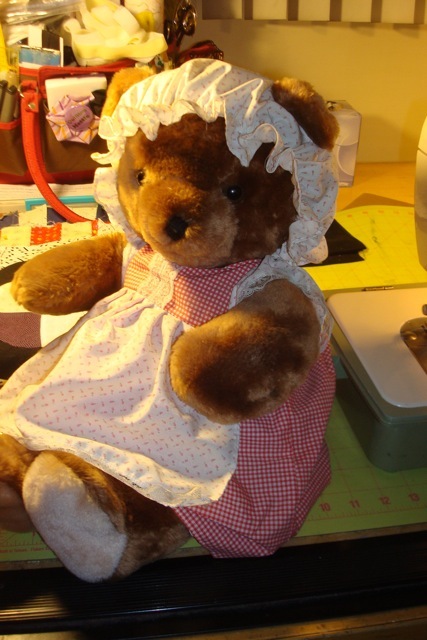 First of all, I’ve finally fixed the hat for this bear. She’s only been waiting a year. My first excuse was that I needed some elastic. Then, I lost said elastic. Then I lost her hat! Finally, I managed to get the hat and the elastic in the same place at the same time (with white thread on the machine and. voila, she’s got her hat back. The other major project I am working on (almost finished!) 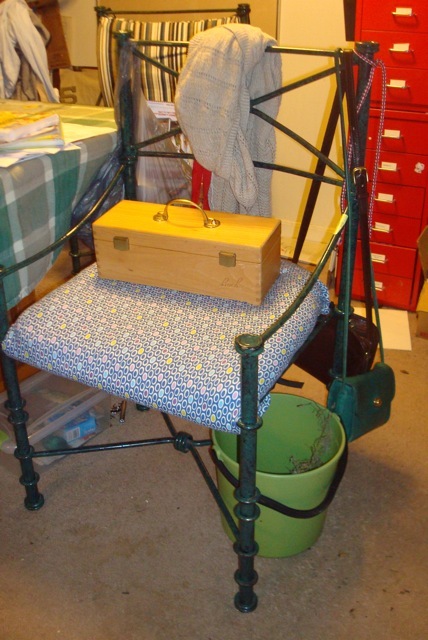 is recovering my dining chairs. Last time I recovered the chairs (about the time I moved in here — 13 years ago or so) I bought fabric on sale, not realizing it was double the width I had expected it to be. It was plaid and I used it everywhere. I was so sick of that fabric that this time, I swore I’d do something different. 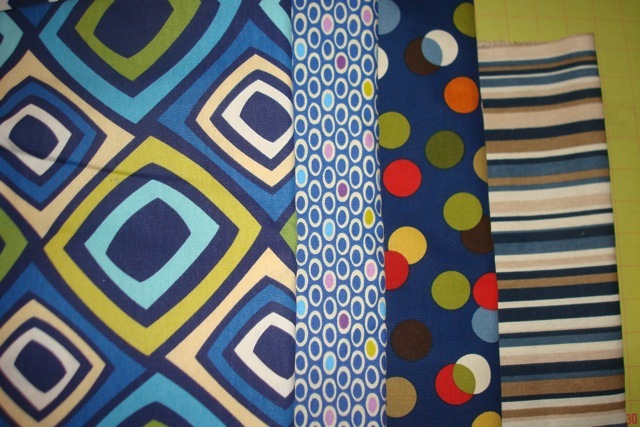 This is the main reason each chair has its own fabric. I probably should have straightened things up a bit before I took the picture, eh? I’ve managed to finish three of them. The fourth is actually pinned against the wall, so it probably won’t get done until after Thanksgiving. So, only one more bit of that plaid fabric is left (not the same plaid as the tablecloth…which reminds me, I need to change that!) So glad to get rid of it. 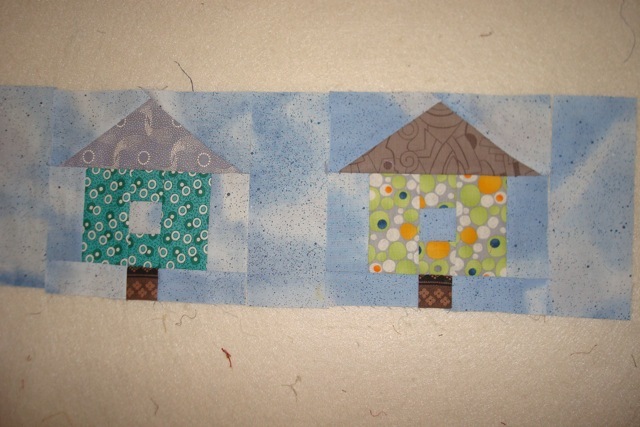 Other than that, I’m writing up the instructions on how to make the bird house block, working on the borders for Oldies (which had stumped me for a while), and cleared off my back porch in preparation for Sandy. 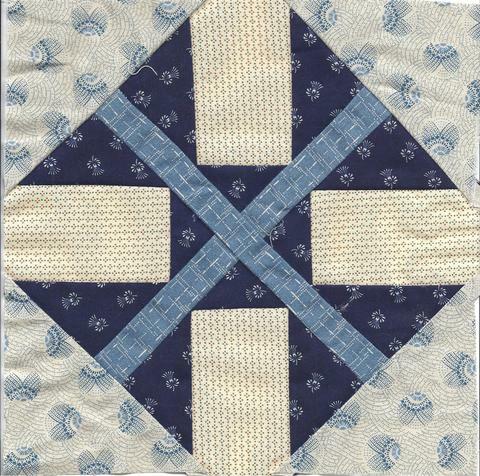 I did not do Barbara Brackman’s Grandmother’s Choice block last week, because it felt redundant. 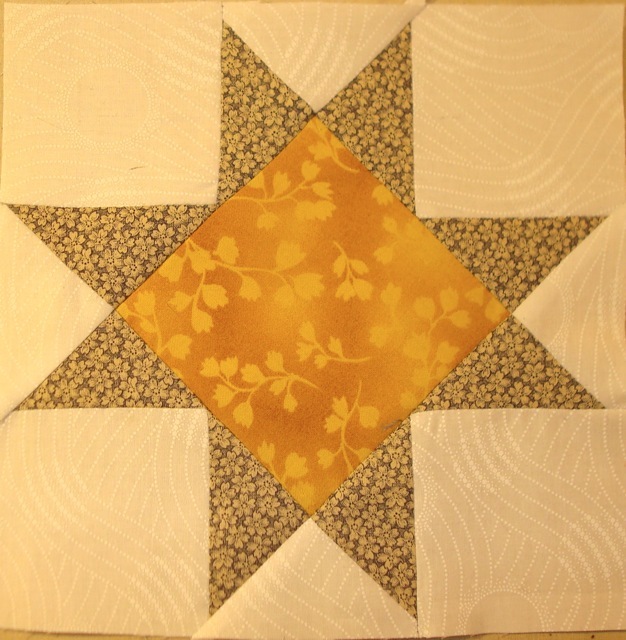 I had planned on “up-sizing” a Dear Jane block, but, even though I drafted it, it did not get made. So. that’s it for this week. 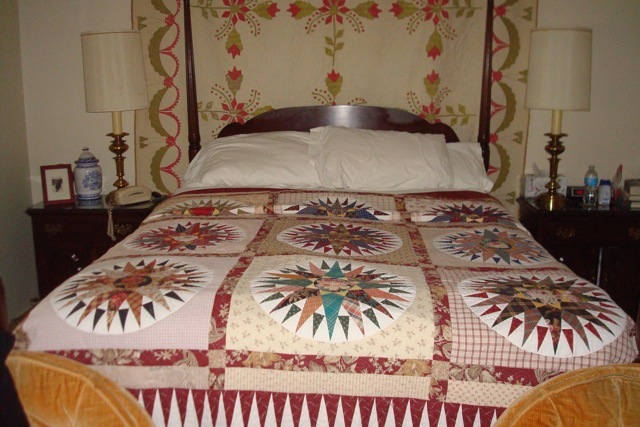 I hope to post again on Thursday and actually have interesting quilt-related stuff to share. 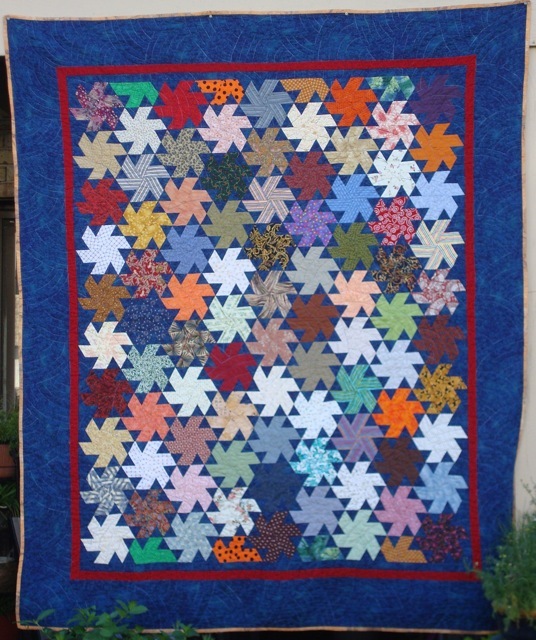 Catherine Wheels won Viewer’s Choice at my Guild’s last quilt show. 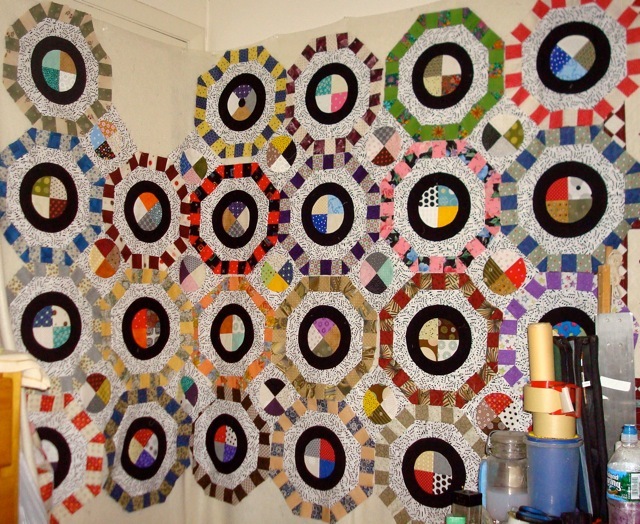 Once upon a time, while I was going through some of my mother’s old quilting magazines, I happened across a Hexagon Whirligig quilt using 30s fabric (probably repros) on muslin. 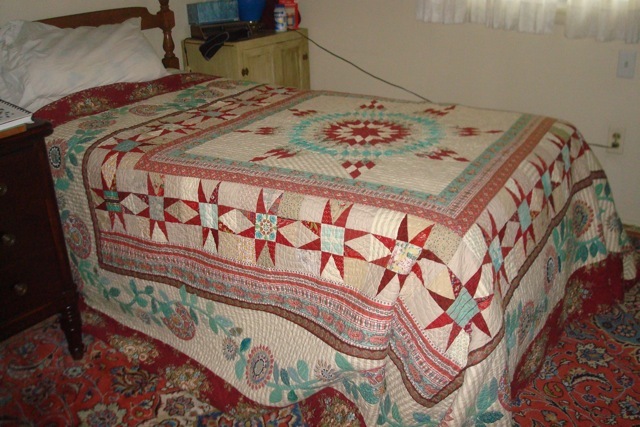 There was no pattern in the magazine, so I took a copy of the cover with the quilt on it and brought it home. I taped it up next to my quilting area to contemplate how it was made. 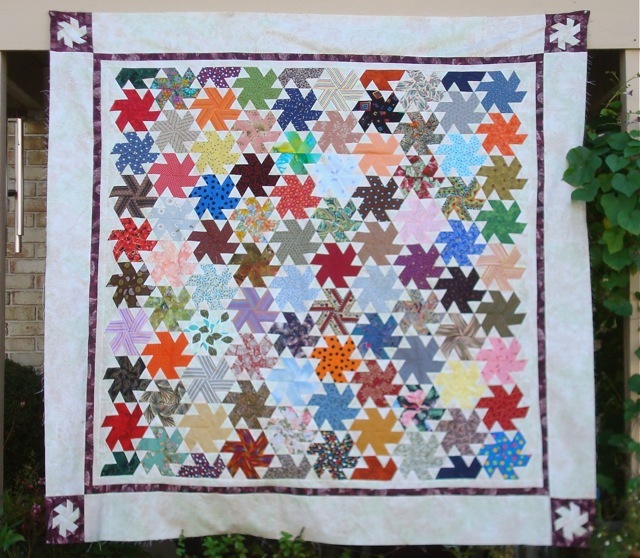 The quilt was so much fun to make that when one of my nearby quilting shops was moving (Quilter’s Way, now in Acton) and they put lots of their fabric on sale, Peg convinced me I needed to make another Hexagon Whirligig quilt, this time with a light background. So I bought three yards of a mottled, pink/green background and started to work similarly: one star a day until I had enough. 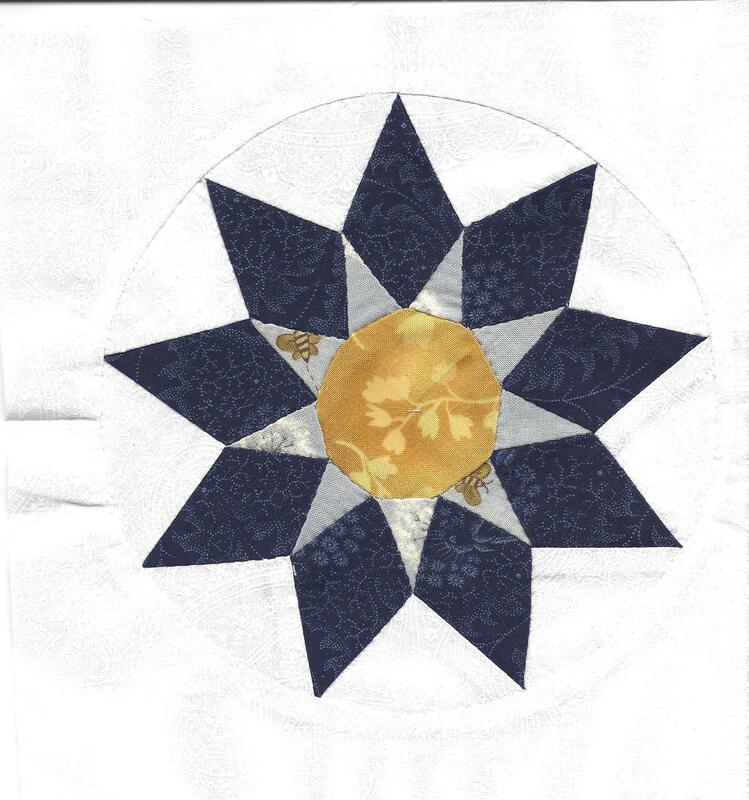 However, since I never can seem to make the same quilt twice, Daystars turned out more square than Catherine Wheels. The biggest difference (other than the background color), however, was that I ran out of fabric. I only needed a 6″ x 14″ piece to make the borders the same as Daystars, but none was to be found.